Given for their chartible efforts as a clown act at Children's Hospital and for The Arc, the Puype Family was honored at a recent presentation. 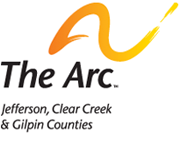 In addition, they were presented with a $2,000 check from the Minoru Yasui Fund which they donated to The Arc in Jefferson County. Thanks, Puypes!